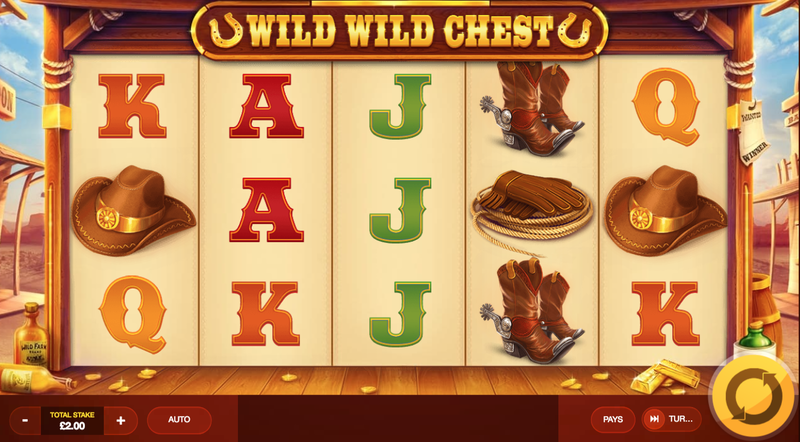 Wild Wild Chest is an online slot game that provides its players with an exciting theme to get lost in and win some money. The mission is to find the hidden treasure which has been lost in a Wild West setting. The game holds much attraction because there is the ability for you to get instant wins along with a respectable jackpot available for some players, but that player could most certainly be you! Red Tiger Gaming have created this wild west adventure which has some exciting features including the regular wilds, re-spins and reel spins. There are also some random tiles to keep you engaged and on track to find the hidden treasure. So get ready to head ‘em up and move and ‘em out and get looking for that treasure here on Easy Slots! Red Tiger gaming have provided online-slot machines to the market since 2014 and provide high quality gaming to players in both Europe and Asia. They are well known for their iconic branding which encompasses the strong head of a red tiger! Look out for their games across a range of online gaming platforms and casinos. What makes their content so appealing is the fact that they specialise in developing high quality slot games to play online – aiming to create iconic and creative themes for their players. Why not come and view more of what we have to offer in terms of bonuses and promo's here on Easy Slots. The wild west theming comes through strongly by the backdrop of the screen comprising a rustic wooden hut. The reels themselves showcase an old school wanted poster which plays nicely with the idea that the players are searching for that much wanted treasure! Playing is made simple by the optional auto-spin element to the game, whereby the reels will spin automatically. Additionally, there is a demo version for the slot machine which allows players to have a go at playing before they stake their money. The stake adjuster is displayed at the lower of the reels and will allow players to choose how much they wish to spend with every individual spin. It is as simple as setting a stake and hitting the spin button! It is a 5 reel, 20 payline online slot machine but for players who like a big payout will be content with the 2,0000x multiplier jackpot! Some of the symbols adopted in the reels include: cowboy pistols, hats, a lasso and boots and gloves. There are also some card values available: 10, J, Q, K and Ace. Wild symbols are the second highest paying symbols (awarding 1,000x your bet jackpot) and these come in the form of three burlesque-wearing ladies. 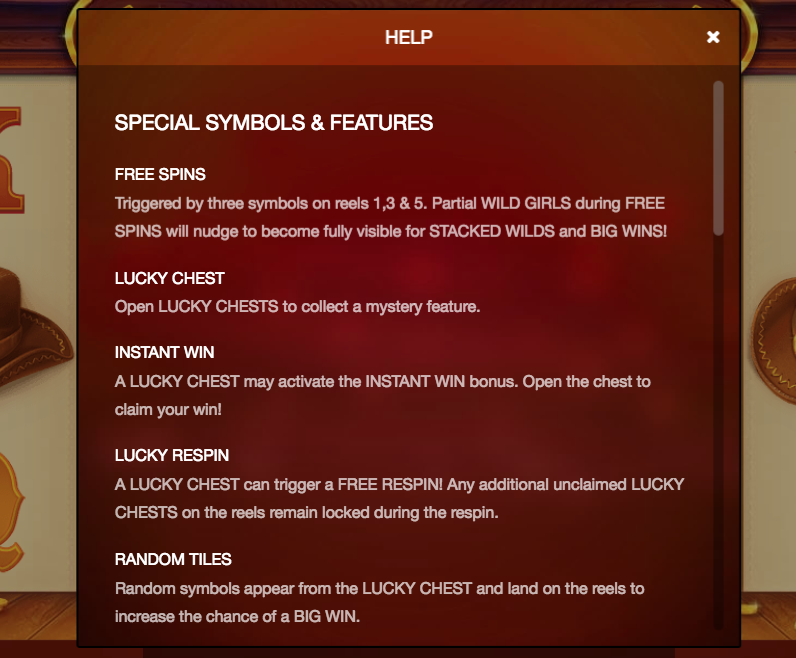 The wild will substitute all other symbols except the lucky chest. The chest itself rewards players with additional bonuses such as instant wins, swapping reels and adding random tiles which increase the chances of winning! Re-spins are also available with a cash prize outcome. Look out for the sheriff’s badge because collecting three of these symbols awards players with free spins. This is a truly exciting online slot game with its strong visuals, inviting theme and additional elements which invites players through increased chances to win that jackpot! Red Tiger Gaming have done a good job here – good luck finding that wanted treasure! Discover more games and learn more.